Do you want your campus to stand out? Not sure where to start? Watersavers offers top quality sports turf grass and can support your college sports field replacement with top one-on-one service and great prices. As of 2016, most NFL teams play on a faux lawn in their home stadiums, and top college sports departments are catching on from the pros. In 2014, Notre Dame Stadium in South Bend, Indiana, made a big change. That’s the year the college decided to swap out their real grass for artificial turf for campuses. The reason? In 2013, Notre Dame University replaced its live lawn four times in a single year. They even had to redo their live sod in the middle of peak football season. Huge effort and expense went into replacing the old classic lawn each time. Consider the impact of literally taking the ground out from underneath players. When games and events are pushed back by grass problems, the schedule changes create a headache for teams and fans. The cost of new sod and labor on a tight timeline wreak havoc with athletic budgets. By choosing faux grass, Notre Dame has chosen a reliable and cost saving surface for their winning team. Albertsons Stadium in Idaho, home of the Boise State University Broncos, has taken artificial grass to the next level. Many college campuses have upgraded to fake lawn, but BSU stands out. What makes BSU so unique? A bold landscape design choice: BSU is known for its synthetic turf that’s colored a fresh shade of blue! Boise natives call it “The Blue,” and it’s a big hit with students, alumni, and fans. BSU’s athletics programs even get publicity from the media for their unique blue colored turf field. Their bold choice to be the first and only college campus to install this bright colored turf has set them apart from all others. What better way to show Bronco pride, while saving water, time, and money with water less grass? With over 60 kinds of turf, including high-quality products designed for heavy sports use, Watersavers can kick off your college sports field replacement. Whether it’s a putting green, football field, bocce ball court, baseball or softball field, or even a soccer arena, we carry the products that are just right for the job. Contact us for a free estimate. Campus games often get delayed or called off due to heavy rain. Although synthetic turf won’t stop the rain; the next day, it can make playing on a college sports field easier. 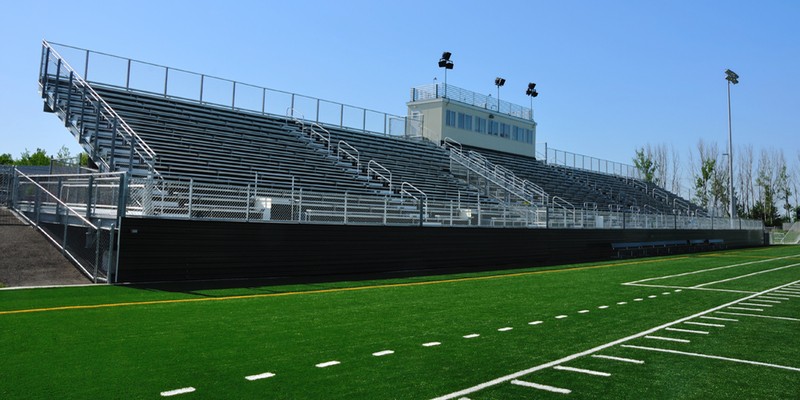 Synthetic grass for college sports fields drains fast and fully, so it less likely to flood during wet seasons. The next day, there’s no mud that can cause slipping, fumbles, and injury. During sunny months, the cost of watering a live field skyrockets. To compensate for the heat, sprinklers have to kick into high gear to keep the real grass green and soft, and replanting is a must when bare patches are worn down to the dirt by hard impact in the heat. With a real grass substitute, maintenance is a snap in any weather, and water use stays low. The fact that fake lawn saves water is great news for the bottom line, and for the planet.